Carolina Wings is actually an exclusive theme based restaurant that was established and expanded in South Carolina. It was founded by Rob Schoolmeester and has its headquarters in Lexington. The company has specialized in Chicken Wings, and Ribs, BBQ Pork as well as in beer. 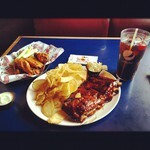 Carolina Wings first opened in May, 1996 and since then they have received an astounding response. People from the neighborhood communities flocked to the tiny local wing point. To make it large the founder, Mr. Schoolmeester later introduced large TV's and kids video games in the restaurant. So, the entire family can now relish their food along with the homely atmosphere. There are currently 0 consumer reviews about Carolina Wings available. Share your review. Please take a note that you are about to post a public review about Carolina Wings corporate office on CorporateOffice.com. This review will be public, so please do not post any of your personal information on this website. If you would like to contact the corporate offices of Carolina Wings, please use their contact information such as their phone number, website, and address listed above to contact them. However, sometimes staff from Carolina Wings headquarters do read the reviews on this website.